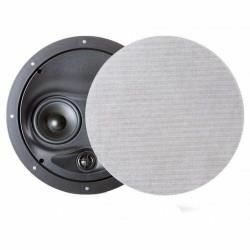 TOA Z-2852C Ceiling Speaker 60 Watt2-Way Wide-Dispersion Ceiling SpeakerRated Input : 60W (High Impedance)TOA Ceiling speaker Z-2852C, daya 60 watt, high impedance, 2-way cone type (Woofer + Tweeter), flush type ceiling, tanpa screw, diameter panel 280mmCasing metal (tahan api), aplikasi cocok untuk..
Speaker Plafon TOA ZS-646RSpeaker tanam di plafon TOA ZS 646R dengan Daya Output 6W; Impedansi: 6W, 3W, 1.5W, 0.8W (100V). Jarak optimal untuk tiap titik pemasangan 3-4m.--------------------------------------------------TOA ZS-646 R Ceiling SpeakerTOA ZS-646 R Ceiling Speaker with 6W Output Power; I..
Bosch LBC 3099 Ceiling SpeakerThe LBC 3099/41 is a flush-mounting ceiling loudspeaker for applications where extra power is required, such as rooms with high ceilings. It delivers a high sound pressure level and has a wide frequency range to ensure excellent speech intelligibility and good quality m..
TOA ZV-064 Attenuator 6 WattTOA attenuator ZV-064, Daya 6 watt,untuk pengatur volume speaker ceiling ZS-646R atau ZS-645R.Level volume : 0ff - 1-2-3 (maksimum)Untuk Fitting box/mounting box/inbow tipe YS-11 dijual terpisah.SpecificationInput Capacity : 6WLevel Control : 4 step; 0 ( off) , 1, 2..
TOA HB-1 Ceiling Speaker SubwooferTHE TOA HB-1 FLUSH-MOUNT SUBWOOFER is the ideal solution for adding low frequency enhancement to commercial, residential and retail sound systems. The HB-1's unique minimum-depth design allows discreet flush-mount installation in ceiling structures or in walls betwe..
TOA Megaphone ZR-1015 (23 Watt Maksimum)TOA Megaphone ZR-1015, daya output 15 watt (22 Watt maksimum), warna putih-biru, batterai sedang 6bh.Tipe Hand grip (genggam).Cocok buat kegiatan touring, rekreasi, gathering, pramuka, dll.Power Requirements R14P (C) × 6 (9V DC)Output Power Rated 15W, max. 23W..
TOA ZS-2852 Ceiling Speaker 15 wattTOA Ceiling speaker ZS-2852, daya 15 watt, high impedance, 2-way cone type, flush type ceiling, tanpa screw, diameter panel 280mm..
TOA ZS-2869 Ceiling SpeakerIntegrated with a speaker unit and panel, the PC-2869 Ceiling Mount Speaker is of all metallic construction and ideal for use in a voice alarm system. It feature spring clamp mechanism for easy speaker mounting to the ceiling.TOA Ceiling speaker ZS-2869, daya 6 watt, high ..